I like this one. I can’t wait to show it to my wife. Perfect for my size family! My wife and I like this design very much. We are planing to build it in the mountains of Panama where the weather is mild. It goes from the mid fifties to the mid seventies year round. They have six months of heavy rains and six months of light rains. Yet the sun shines every day, the rain is part time only. Would it be too difficult to improve air circulation; i.e:. upper vents, lower vents in different rooms, etc. My second question is regarding the extension of the porch around the entire house. When we are ready could you include these changes in the plan? For a price of course. We love your designs Owen for being practical, to the point and very well thought out. I just stumbled upon this website. Fantastic resource. I am researching (as a hobby) on sustainable housing options for the Tampa, Florida region. The big concerns are dealing with the heat, bugs, and weather. Can an earthbag home be built to deal with all three? 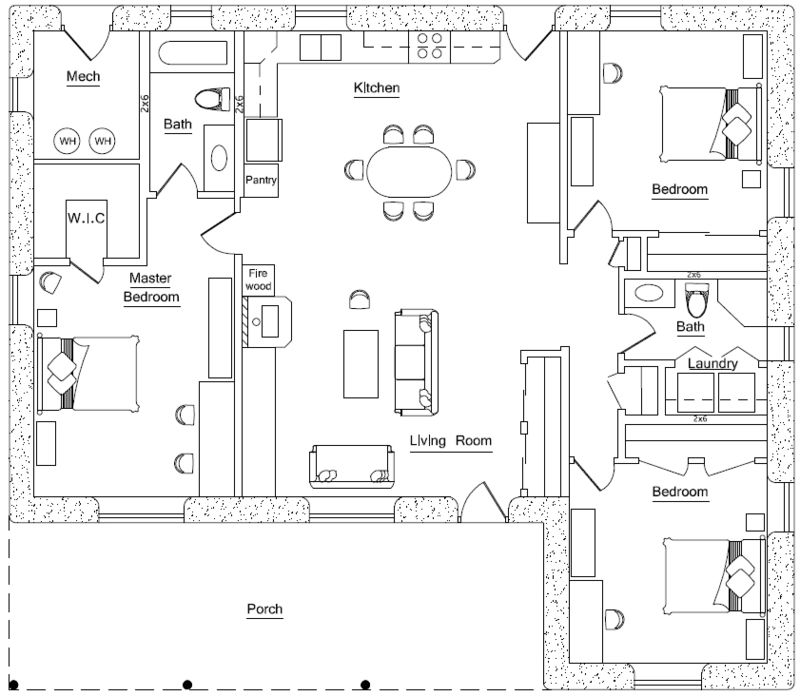 Also, I love this plan and is their an option to add a 4th bedroom? I have several designs that would work for your situation: this design, Beach House and Summer Breeze. Then it’s just a matter of making small changes, depending on where you live. For instance, you could adjust the roof overhang slightly, add shutters to windows, and so on. Custom plans are available from Dream Green Homes.com. At check-out, click on custom fees. First though, we’d have talk more about what you want and then I can give you a fixed quote. My wife and I are ready to buy the beachcomber plan. We really want the Torus plan but feel the property we have now would be too small for it. At any rate, should we speak with an engineer first to understand codes & requirements for this area (Houston, TX. – Harris County) and expect to have someone else draw them up, or should we buy your plans first, and then you tailor them to local requirements? I’m so ignorant of how this works. But I noticed your plans don’t seem to include plumbing & electrical. And we would want to include an HVAC system do to this particular climate. Please give me some feedback (and some education) of how this all works. We are really concerned about the foundation. Houston, is very humid all the time and can get to be exceedingly humid. We’re prone to flooding at any given time through the year, season excluded, and the heat is near legendary. In this ‘City on the Bayou’, the pavement has replaced the wetlands, but not the climate. For sure, you always want to know the code situation before spending money. In general, Texas is one of the better states for alternative building, but in the cities you’ll always have lots of code issues. Strict building codes pretty much wipe out most of the savings. Owen, are these plans available in reverse. We are aligning the house to magnetic north for the Kitchen wall because the “porch” area will become greenhouse and face south. A reverse will put the long wall on the west side and we are going to eliminate west facing windows except for a high on the wall small window for the bathroom. We are also in the Houston area, although we are outside Harris county and the only inspection we have to have is septic. I will build interior to national building code so no problem there. Is there a recommended surfacing agent so walls won’t be susceptible to the humidity and we can have smooth walls? We already plan on plenty of overhang on the roof to help protect the sides from rainfall. No extra charge to mirror plans. There are standard sealers on the market such as siloxane that will do what you want. Allow plenty of time for the walls to dry before applying sealers (which you probably don’t need). Owen, we are planing on this plan for our house, also in Houston. I want to have a greenhouse across the front as well. My husband wants to use radiant heat and I want to have a rocket stove mass heater. I am concerned with over heating from the green house during the summer. Should we consider using an insulating substance rather than soil to keep cool. You’ll be okay as long as you section off the greenhouse from the living space. Plants and humans have different needs and so you need to close off the greenhouse. Add automated fans that kick on and off based on temperature. The fans can 1. blow heat into the house when needed, 2.blow heat outside when not needed. Im moving to a farm in decatur tx.. area is hot but mildly humid.. any ideas for me? We live in Virginia…hot and humid spring to summer but winters can be mild to frigid. Would you recommend an earthbag home in our area and what modifications? You could use most any design that appeals to you. You’ll probably want to add foam board insulation on the exterior.